Experience the ultimate adventure vacation by eliminating homelessness. Work for one to three weeks on a Habitat building project in Africa. Contribute to society while working alongside people in a foreign land. adults only. 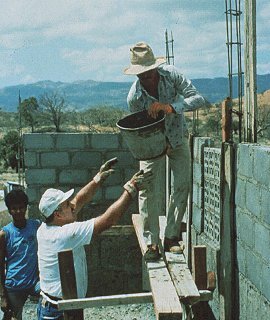 Travel picture of Building homes in foreign lands. I would like to offer my time and energy to give back with what i am blessed with. I have spent a long time in construction and would like to help. If you think i may be of some use please contact me . I would like to help building houses in Africa in my annual vacation in 2011. Better and more satisfying than spending time for resting. Life is short, we should help more to delete the cliff between poors and riches. Hope you contact me. I would like some information on how I can get involved with building some homes in Africa. Im a 23 year old Canadian male with Red Seal in Carpenter, and a back ground in metal fabrication. With 8 years of experience in trades. I look forward too hearing from you. My name is Mina and I am an Structural Engineer. I graduated with Civil Engineering degree on Aug 2012 and have been working since. My passion is to become part of a group or an organization for build houses in Africa. If you can please send me some info on that I would greatly appreciate it.